Even though we all may have heard at least a million times by now the famous “black don’t crack”, it doesn’t mean that your black skin is never ever going to age. Truth be told, it’s nice to look around in your family at the older women or at the famous celebrities- that seem not to have aged at all. The melanin surplus may win you some time when it comes to wrinkles, but it’s not going to protect you against skin cancer nor hyperpigmentation. You really need to get serious about your skin-care regimen and if your skin is dark there are some typical problems you may have to deal with. Scroll down for some useful tips that you need to consider when taking care of your brown skin. Melanin is able to protect you not only against UV damage and sunburn, but also to keep at distance aging signs as brown spots, wrinkles and blood vessels that are easy to see. Typically, a dark skin is going to show less wrinkles and age spots and only later in life. African-American skin has more oil that protects it against dryness and wrinkling too. As the African-American skin has more oil content or sebum, this means it actually includes natural moisturizing factor that have a great influence on skin and its aesthetics, since the risk for drying isn’t high at all. This doesn’t mean you shouldn’t do anything at all for your skin. You may give it a little help with a retinol product that are going to even out your skin tone and brighten it as well. Some antioxidant-rich serum may help your skin fight against the free radicals that cause inflammation. Using a daily moisturizer with SPF is the very first thing you could do for your dark skin. Sunscreen is essential when it comes to taking care of your skin. A sunscreen moisturizer doesn’t just protect your skin from sun’s bad UV rays, but also slows the skin aging process. Unfortunately, all ethnicities may get photo damage, but it’s going to look different on different skin. The darker skin is going to show photo damage with hyperpigmentation that gets worse in time, especially on lower face and on the cheeks. An uneven complexion is in fact the result of sun exposure, when it comes to the darker skin people. The extra melanin does bring some good things so darker skin presents lower risk to sunburn and UV damage in time. This doesn’t spare you from wearing sunscreen all the time as you still present some risk for skin cancer. Just because you know you have to wear sunscreen doesn’t actually mean that you’re going to wear it too. It’s not that easy to find a moisturizer with an SPF30+ that looks great on the darker skin. You don’t want to use anything that is chalky or pasty either so finding the right moisturizer that offers sun protection may become quite a challenge. Hyperpigmentation, aka the darkening of the skin in specific areas, may be caused by an eczema flare-up or the result of inflammation after a bout of acne. Melisma, a skin issue that presents with areas of hyperpigmentation is quite common in darker-skinned people and may happen after sun exposure, pregnancy or even after using oral contraceptives. Even though sunscreen may keep at distance hyperpigmentation, you may still have to deal with it and using some topical products may actually have lightened the darkened areas. The most important ingredient in lightening products is hydroquinone that helps blocking the enzyme that produces melanin. All patients should be informed when using hydroquinone, as it may be irritating, causing unpleasant side effects. For instance, you may experience permanent small brown deposits on your skin. You may still use hydroquinone, but you should also consider take in some physician-strength products that contain brightening ingredients like licorice, azelaic acid, kojic acid and glycolic acid. Don’t forget about the sunscreen as even skin tone may also develop hyperpigmentation after 5-10 minutes in the sun. sun exposure is going to darken any hyperpigmentation that is already easy to notice. Darker skin is more exposed when it comes hyperpigmentation and scarring. Which is why many dermatologists suggesting swift and stringent treatment coursed for rashes, acne, eczema on brown skin tones. When you need to treat acne or various skin conditions in darker skin, you may want to be a bit more aggressive as you don’t want to end up with some post-inflammatory hyperpigmentation. The minute you have the current inflammation under control, you may proceed with any scarring or darkness that is left behind. Not all dermatologists out there know the real deal when it comes to the darker skin. You need to find someone that really knows by heart the problems and the solutions for your darker skin. Whether you go online and find him or ask around, it’s entirely up to you. It’s more important that you don’t just go to the first dermatologist it comes to mind. Fair skin people don’t need to worry much about handling the laser treatments when removing wrinkles or brown spots, but anyone with darker skin has to be more cautious when it comes to the laser machines. When you’re using a laser, you’re actually applying heat that has effect on the melanin layer and may cause inflammation of the skin. The whole process may cause an even larger pigmentation problem, that is more difficult to solve. If you’re planning to use some laser hair removal treatments, that are some things to remember. The lasers point the melanin in your hair and when you have dark hair and a dark complexion, it’s more difficult for the laser to make the difference between them, causing scars or burns. Fortunately for everyone with darker skin, there are the Nd-Yag lasers that are the best choice for the darker skin tones. Stay on the safe side and always get a certified practitioner that has experience with the brown skin too. 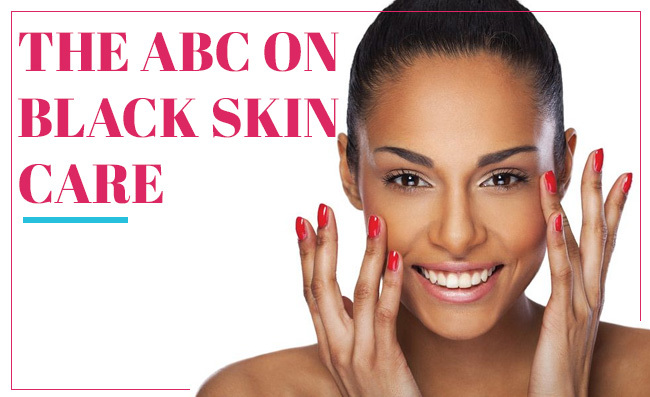 Here are some simple steps you need to take when you want to give your darker skin the proper care. As long as you’re following these steps on daily basics, you shouldn’t stress much about the health of your darker skin. You need to moisturize your skin every day as black skin is dry and an ashy appearance is quite common. Get a lubricating facial moisturizer that includes humectants as it’s a great choice for your black skin. As humectants attract water, they are going to maintain your skin suppler and softer. If your skin is oily, you should go with an oil-free cleanser instead as it’s not going to clog your pores. Use a moisturizing body wash and wash your skin every day. Check up for ingredients like urea, glycerin, dimethicone, and hyaluronic acid as they’re great for your darker skin. Get a clean washcloth or a shower puff to apply the body wash.
Don’t forget about using a different facial cleanser in the morning and at night for cleaning thoroughly your pores, after removing cosmetic products. Always protect your skin from the sun with a daily sunscreen with an SPF of 15 or even higher. Even though your skin is dark, this doesn’t mean it’s immune to sun’s rays. As a matter of fact, black skin isn’t protected against wrinkling or skin cancer either. Keep in mind to exfoliate your black skin from time to time as it’s quite exposed to roughness and bumps, which appear due to buildup of dead skin cells. You only need to exfoliate once a week if your skin is thin or dry, but an oily or combination skin type is going to need exfoliation twice or even three times a week. Make your skin smoother and use an exfoliating cream or a shower loofah. What you eat and drink has a lot to say on your skin’s condition too. Therefore, you should eat healthy and drink at least 8-oz. glasses of water in a day. Make sure your diet includes vegetables, fruits, whole grains, and proteins so that your skin always stays glowing from the inside out. Never take the short road when it comes to taking care of your skin. If you’re not going to apply a sunscreen, moisturize or wash daily your skin, you’re going to miss the glowing appearance of your skin and may even look older than you are. Get a moisturizer especially designed for your skin if your skin is sensitive. You should get a different cream for your body. Last but not least, at least 30 minutes of daily exercise is going to make your skin toned and healthy so keep that in mind next time you’re passing by the Gym.